Michel Chion. Sound: An Acoulogical Treatise. Duke University Press, 2016. 300 pp. First published in French in 1998, Sound, An Acoulogical Treatise is a broad collection of essays that appears oddly disjointed, traversing disparate disciplinary polemics and philosophical dilemmas, while introducing a dizzying series of new concepts in each chapter. The apparent incongruity of its parts, however, are unified by Chion’s political commitment to a form of disinterested study that is both incorrigibly antiquated and refreshingly innovative. For what ties each chapter of the work together is a modernist approach to art that seeks to insulate the object of its concern from the various “distractions” of our social world, in order to create a heightened attention to and appreciation of the thing-in-itself: sound. Though it is fairly commonplace to write off such appeals to disinterested study as irredeemably naïve, a product of some stereotypical desire to repress all the worldly “irritants” that taint an unbridled appreciation for one’s art object; Chion’s hope is that in suspending our disbelief, we will reveal the transhistorical constant that structures our experience of sound, thereby allowing the world, with its historical changes and cultural differences, to appear before us in greater relief. And, indeed, Chion will claim that his analysis does just that: because sounds are everywhere, occurring all at once and yet fleeting, our aural experience, he asserts, is always structured in such a way as to filter out some sounds over others. In music, for instance, we make use of refrains, ritornellos, and reprises — or choruses and hooks — to offer our ears a second chance for listening (35); in education and business, schools and office spaces are built with sound dampening materials that are designed to stifle ambient noise in order to increase our productivity; while in transportation, car horns are tuned to play dissonant chords at a relatively high volume levels in order to garner our attention. However, this dual ontological problem of sound – its spatial ubiquity and temporal impermanence – has, with the invention of recording, been fundamentally altered: for recording does not merely freeze the past, but alters the way we hear the present, as our perception of the acoustic environment collapses into the single point of a recording device (141, 147, 211). Given these fundamental changes, how, then, have those disciplines to which we have entrusted the study of this problem called sound – acoustic science and music theory – fared in accounting for our experience of the sonic world and the complexities that comprise it? Rather poorly, Chion assesses, creating the disciplinary exigency for him to innovate his “acoulogical” system of sound study. For the problem with music theory – one of many culprits in Sound – is that it would have us partition the sonic world into four fundamental categories–pitch, duration, intensity, and timbre–and anything that falls beyond the scope of these acoustic registers is banished as mere noise (216-220). Music theory has therefore established its own hierarchy of listening, designating which sounds are worthy of our attention and appreciation and which are not, through the exacting laws of musical form. In the realm of pitch, Alfred Döblin named this propensity for some sonic characteristics to dominate over others, the creation of “king sounds,” pitches that rule over their acoustic territory like the reign of a monarch – a problem that Arnold Schoenberg set out to overcome by creating a musical system (twelve-tone serialism), based on the idea of preventing a single pitch from determining the musical key (198). Indeed, so focused on the exactitude of pitch are the listening habits of music theory, Chion will argue, that “complex sounds” now foregrounded by hi-fidelity recordings– such as the breath of a flutist, fingers clicking on trumpet valves, and hands sliding across a fret board — are entirely occluded from the 5-staff notational system set out to encompass the world of music theory (56). Similarly, when music theory is tasked to observe sounds with a flexible rhythm, as in Jazz, various notational artifices are required, otherwise improvisatory deviations from the expected beat are set aside as “syncopations” (220); intensity fares no better, as it depends above all on context and contrast: soft and loud markers indicated by piano (p) and forte (ƒ) symbols are relative and therefore vague, requiring dynamic indicators and multiplying them ad infinitum: crescendo, decrescendo, diminuendo, morendo, marcato, perdendo, sforzando, and so on (217). Timbre, however, is Chion’s smoking gun. A conceptual catch all that music theory has itself created to describe its own inadequacy in defining the sonic world, for everything that falls beyond the scope of its acoustic registers is called timbre: why does a trumpet sound like a trumpet even if its pitch, duration, and intensity are identical to that of another instrument? It is because it has the timbre of a trumpet! Timbre is therefore a tautological waste basket for the qualities that make up a sound beyond the purview of music theory (217). To name these limitations, as Chion notes, is not a novel pronouncement, for the noise compositions of Luigi Russolo and the Bruitists; the graphic notational practices of Cornelius Cardew, Anthony Braxton, and Iannis Xenakis; or the music derived from the manipulation of the audiovisual signals found in the recording technologies of musique concrète (of which Chion is himself a practitioner), are so many indirect comments on the habits and limits of 19th century listening practices (70). Acoustic science fares no better, for amplitude (dB) and frequency (Hz) likewise fall short of Chion’s desire to describe the noise of life. By operating under the premises that the scientist is not part of the experiment, acoustics obviates one fundamental factor in sound: the listener. For the decibel, that apparently objective measure of intensity, omits a number of perceptions related to our sense of variation and contrast, including the movement of the listener, whom it must fix in space in order to get an “accurate” reading relative to the sonorous object. For if either point of reference – the subject or the object – move, the intensity obviously changes. And so acoustics relies on a rather static and therefore impoverished condition of analysis, one where the human subject, in all its variability, is reduced to the status of a motionless and unchanging recording object: a microphone to which a decibel meter is attached. A problem that acousticians have continuously tried to address in their search for that ever enigmatic point of fixed aural reference that would cure their relative measuring ills: for where, after all, does listening actually occur? Do we hear in the cochlea, or is it sent to the tympanic membrane? Or maybe it all happens in the brain? (20) This failure to objectify the social and historical malleability of our relative sense of volume is no surprise given that the decibel was a unit of measurement invented in the 19th century to assess the sense of perceived loudness and softness between telephones, that is, two fixed points in space. Given these shortcomings of psychoacoustics and music theory, Chion develops a new discipline he believes is capable of describing and training us to listen to the fullness of our aural life: acoulogy. In acoulogy, sound is neither an object that causes a vibration, nor a sensation that we experience, but the name of a problem: sound is a bad concept. Not only do we lack the appropriate tools to understand the continuous bloom and buzz of our acoustic environment, but such ecological metaphors (“acoustic environment”) are too vague to be of any use (194); instead, there are only different kinds of sounds (e.g. bangs, buzzes, bops, screeches, etc. ), and we must develop a proper lexicon that can apprehend our sonic world and fit it into forms and general profiles (189). In describing and cataloguing our sonic experiences ranging across several media, Chion employs and invents an overwhelming array of concepts: ergo-audition (91), acoustic decouplings (144), audio-phonotary loop (93), materializing sound indices (103), identified listening (112), acoustic isolate (143), phoric sensations (144), single-sensory extraction (144), spatial magnetization (155), vococentrism (156), and complex mass (175)– to name only a few. His preference for “spoken” language over notational symbols or mathematical formulas is his way of avoiding the pitfalls of heirarchization; since language fails, and fails constantly in its aim to communicate an experience, we should find ourselves rearticulating and renegotiating our terms, enlivening our description of sound and therefore remaining forever contemporaneous with whatever noisy novelties may come our way. The ostensible goal of acoulogy is thus to “mentally control our perception… through an active and disinterested exercise of our perceptual capacities” (242) so that we can “enrich all of existence… and one day discover unforeseen opportunities, applications, and consequences” (211). 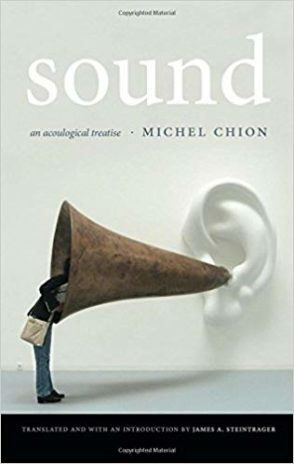 But Chion’s phenomenological approach to sound has its own limitations that hamper his analysis, for any phenomenology must, at one point or another, confront that boogeyman which continues to elide it: the social. But Chion staunchly dismisses methodologies of social and ideological study as he finds them inspired by a certain scorn for their objects of analysis, lacking a true attention to the thing-in-itself that his “disinterested” discipline can provide (242). However, I cannot help but think that “the audiovisual flood” (241) of modern life that Chion so desperately seeks to overcome, and its attack on listening — “the least defended” (242) of our senses — is the form of appearance that sound takes under the logic of late capitalism, an observation that could be further developed by a social and historical analysis of aucology’s ontology of sound. For what Chion describes as sound’s transhistorical ubiquity seems like just another description of how contemporary industries seek to induce consumer desire in period of wage “stagnation” and job insecurity. For how else is a capitalist to ensure that a worker’s new found credit is directed back into their hands unless the audiovisual field is flooded with advertisements that attempt to construct and dictate consumer desires? Of course, such an attempt to control consumer desire is not always properly decoded, and so an ever-stronger and more active legal and bureaucratic infrastructure must be erected to police any deviations from this course of capital accumulation, often by teaching us what sounds are pertinent and which are not, in a field of all-pervading clamor. And so Chion’s program, to train and defend our listening in a ubiquitous environment of advertising noise, should be understood as the result of a historical phenomenon tied to a broader struggle between capital and labor – rather than a transhistorical reality marked by sound’s omnipresence (27). As a feature of late capitalism then, the audiovisual flood of the post-recording world would be part of what Guy Debord called the society of the spectacle: a world so commodified that no social space remains untouched by the manufactured desire for capital and consumption. For in late capitalism, we are always at work: the sounds of the home mirror and reflect the modern office as the universalizing spread of commodity-culture has seemingly become so ubiquitous as to invade all aspects of life with the electronic lull of modern machinery. Technology, from this historicist perspective, is then a facilitator rather than a historical cause, for the continuous buzz of a world flooded by noise is a symptom of the disintegrating boundary between work and life, labor and leisure; as the degradation of existence, driven by the desire to accumulate capital, spreads and the sounds which are contiguous with it follow us everywhere. Acoulogy’s desire to reclaim the “perceptual windows of our body” (242) through the practice of honing our descriptive abilities, is then a utopian impulse that can be seen as a desire to reappropriate the ear from those appropriators who have dulled it through constant bombardment (241); a place where listening can once more be purposefully directed and unalienated; and where the partition of sound into various hierarchies of significance are levelled. Whether or not we find such an image of acoustic horizontalism convincing or desirable, and the disinterested method of acoulogy and acousmatic listening that’s supposed to usher it in plausible, the benefit of Chion’s intelligent idealism lay in its ability to help us map the ideological field of sound studies, and the historical deadlock to which it responds: the ubiquity of labor time and its concomitant spectacle. Karim Wissa graduated with his PhD from the Program in Literature at Duke University in 2018 with a specialty in Critical Theory. His dissertation examined the changing syntax of Jazz music in the United States and its relation to shifts in class dynamics.